Strong core muscles help to support your posture, keeping your spine aligned correctly. As you age, the muscles in your abdomen and back weaken, potentially causing postural problems and back pain. 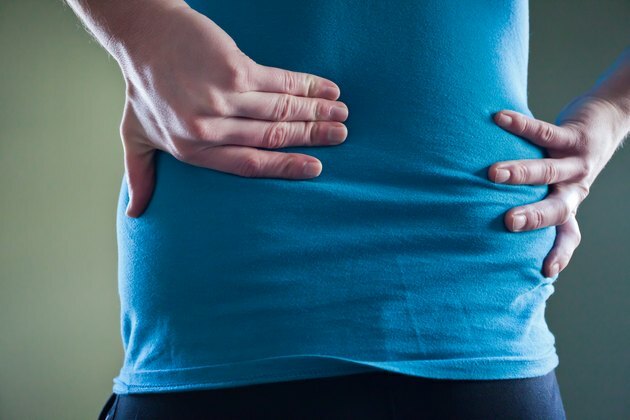 Performing exercises for your core – which includes your abdomen, back and pelvis – might help to alleviate stress on your spine and promote a healthy back. Talk to your doctor about your back issues to determine which exercises are right for your condition. Muscles in your ribs, back, abdomen, legs and buttocks attach to your spine, putting pressure on the vertebrae. Balance among these muscles is a necessity to maintain proper posture. If one muscle group is too large or another is too tight, your spine might curve or sag, creating stress on cartilage and nerves. Muscle imbalances can lead to pain as well as decreased mobility. Your abdominal and back muscles work on opposing sides of the body, but produce a similar result – a straight, strong spine. Poor conditioning of these muscles increases your risk for back injury or pain. Include movements that strengthen the back and the abdominals, rather than just one muscle group. The most important muscles to target during abdominal and core exercises are the deep core muscles, such as the transversus abdominis. Regular crunches and sit-ups work the rectus abdominis, or the superficial abdominal muscles, neglecting the deep muscles that are key spine stabilizers. Pulling your navel in toward your spine activates the deep muscles, a movement that can be done even while sitting in a chair or lying on your back. Holding the contraction for 10 seconds and repeating five to 10 times is an effective core exercise by itself. The cat-cow poses are yoga postures that stretch your spine and engage the muscles in your abdomen and back. A gentle exercise, you can perform these poses after acute back pain has receded. Beginning on your hands and knees, relax your back and belly, allowing your stomach to sink toward the floor as you inhale and look up to the ceiling. Exhale and pull your navel in, rounding your spine and looking toward your navel. Repeat the exercise sequence a few times. Holding a plank pose, even while on your knees, is an effective way to strengthen your core muscles. Since this is a more advanced maneuver, perform this pose after you have built up your core strength to avoid muscle strain. 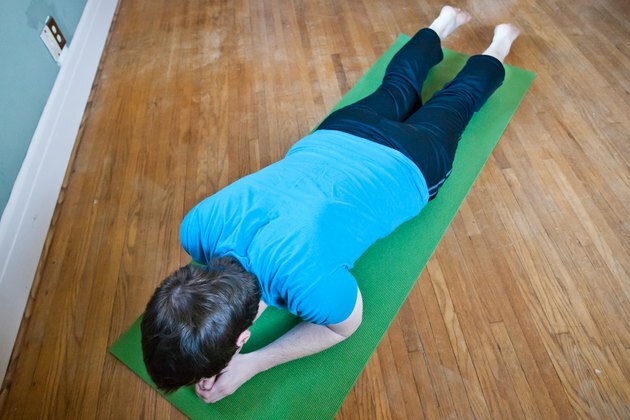 Lie on your stomach on a mat or floor. Raise yourself up onto your knees and forearms, making sure your elbows are underneath your shoulders. Your head, neck and back should be in a straight line. Pull in your navel to maintain a straight spine. Hold this position for three deep breaths. For an additional challenge, you can come up off your knees and elbows, maintaining the pose from your hands and feet. Spine-Health; Back Exercises and Abdominal Exercise Recommendations; T.E. Hyde, D.C.